For a contribution of $50 (or $25 for page alumni under 30-years-old), receive one-year membership in the Alumni Association, which includes discounts to regional alumni events, U.S. Capitol Page Alumni membership pin, and one-year password access to the page alumni online directory. For a $75 contribution, you will receive: U.S. Capitol Page Alumni Association annual membership benefits (listed above), plus one-year membership at the Charter Society level in the U.S. Capitol Historical Society. Membership in the Capitol Historical Society includes online access to the electronic edition of the U.S. Capitol Historical Society newsletter, eligibility to join the U.S. Senate Federal Credit Union, 10% discount on all U.S. Capitol Historical Society merchandise, a complimentary exterior walking tour of the Capitol, and listing in the U.S. Capitol Historical Society’s “Capitol Alumni” as a former employee in the Capitol. 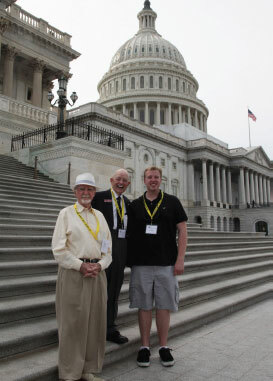 In 2013, the Alumni Association partnered with the U.S. Capitol Historical Society, a nonprofit organization dedicated to civic education and promoting the unique history of the Capitol and those who have proudly served in it. Click here to learn more about our special partnership with the U.S. Capitol Historical Society. Please fill out the information below and click the button at the bottom to join. If you elect to pay online you will be forwarded to Paypal.com to complete the transaction. You do not need a Paypal.com account, only a major credit card. Apt #, Suite # etc. Leave blank if unnecessary. What type of page were you? Please select one. Were you a school year page or summer page? Please enter your undergrad alma mater. Your graduate school alma mater, if applicable. Your employer or organization, if applicable. Do you have family members who also served as pages? List them here. Please list the Senator or House Member who sponsored you to be a page. Join the US Capitol Page Alumni Association to reconnect with alumni at local gatherings, share your Page experience, preserve Page history, and support the Page Program.